Iconic Green Bay Packers coach Vince Lombardi is famous for telling his team: “Gentlemen, we are going to relentlessly chase perfection, knowing full well we will not catch it, because nothing is perfect. But we are going to relentlessly chase it, because in the process we will catch excellence.” New Orleans legend Gregg Martinez has certainly taken Lombardi’s advice on his new album, Soul of the Bayou. On track after track, he’s nipping perfection’s heels, pursuing it straight to a finish line just over thirty-seven minutes. Yours truly wishes Martinez would have endured a bit longer, with one or two more numbers to round out his race to attain flawlessness. Gregg’s vocals are as warm, comfortable, and reassuring as an electric blanket on an icy night. Late winter’s chill will never enter one’s bones as long as one’s ears are listening to him. On three original masterpieces and seven spectacular covers, he pulls out all the stops with his longtime backup band, the Delta Kings. How famous is this stellar senior citizen? The late Ed Bradley of 60 Minutes called him “one of America’s greatest hidden treasures.” He also had an exclusive performing contract with our current President and his then-wife, Ivana Trump. To top it all off, he has been nominated four times for Best Male Vocalist by OFFBEAT Magazine – the only one outside of New Orleans to ever receive a nod in this category. He recently had the incredible honor of singing for the funeral of the great Percy Sledge. According to current publicist Bruce Flett, as of December 9th of last year, Soul of the Bayou had reached #4 on the soul album charts and #5 on the R&B charts of the Roots Music Report. Along with lead man Martinez are Charles Ventre on keyboards; Gregg Kingston and Tony Ardoin on guitars; Sid Daigle on bass; Tim Courville on drums and percussion; Mike Pollard and Pat Breaux on tenor sax; Mike Ritter on trumpet and flugelhorn; Alex Melton on baritone sax; and Tracy Menard and Charlene Howard on background vocals. Special guest stars include James Martinez on a guitar solo for the CD closer and Sonny Landreth on guitar for track five. The three tracks below are spectacular, snagging your attention before you even know you’re hooked. Track 01: “I Can’t Stand the Rain” – With a guitar intro that would make the blues masters of old rise from their graves in admiration, this album’s opener is a stunning cover of a Peebles, Miller and Bryant hit. “I can’t stand the rain against my window bringing back sweet memories,” warbles Gregg. The horn section is also terrific, providing a higher level of background energy to the mid-key ballad. Track 05: “That Old Wind” – Eric Clapton’s favorite slide guitarist, Sonny Landreth, guest stars on this traditional blues original. “Takes a hurricane for me to be turned. Bring on the rain, thunder and hail,” our narrator says in a turnaround from the sentiments of song number one. This one’s a romping, stomping good time, perfect for the barroom and the country club alike. Track 09: “Mac Daddy” – A rollicking riff on his nickname, “Mac Daddy” boasts perfect piano keys from Charles Ventre and great lump-de-lump rhythm from the guitarists. “I drive a ragtop Caddy; I’m a real Mac Daddy musically,” boasts Martinez. “Everything I do, and everywhere I am, I’m always up to speed.” Indeed! He’s earned his bragging rights and then some. 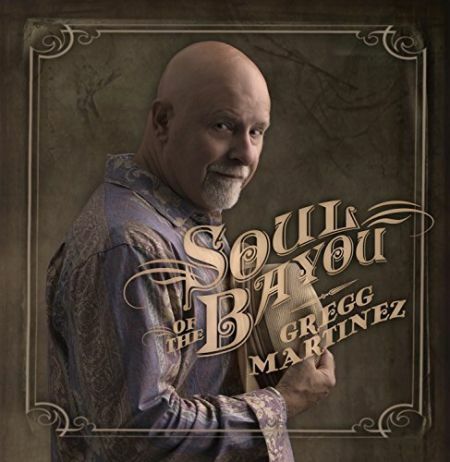 Gregg Martinez chases perfection and nearly catches it on his superb Soul of the Bayou!